While I was at the store picking up the Guinness Draught for Monday’s review (here) I noticed another can of Irish stout that I wasn’t familiar with. 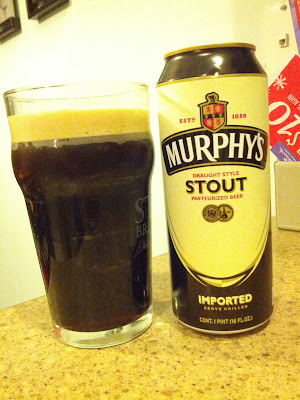 That can is Murphy’s Irish Stout, usually just referred to as Murphy’s and is what I’ll be drinking tonight. Murphy’s has always been a second runner up to Guinness in sales but lets see how it compares in taste. See that gray stuff under the head, that’s why you need to do a good job cleaning glasses. Pours a deep dark brown with a thick light tan head that is holding firm. Another good looking beer quite like Guinness. Not a tremendous amount of aroma but what’s present is roasted malt and a bit of sweetness. Taste follows suit with roasted malt, chocolate milk sweetness, a hint of coffee, and some malty bitterness. The mouth feel, like the color, is one of the shining points of this beer. Amazingly smooth creaminess with a light-medium body. This beer is… a beer it’s not really interesting. As far as comparisons to it’s better selling counter part they’re extremely similar. Murphy’s is the Miller lite to Guinness better selling Bud Light. They look the same, smell the same, pretty much taste the same… basically the same. Regardless I like this one slightly better, mostly due to the taste and it’s increased bitterness. That said I’m over Irish Dry Stouts and can’t wait to try Great Divide’s Oak Aged Yeti Russian Imperial Stout tomorrow night, WooT!